Batman (in fact, he was soon replaced with a younger version, and allowed to grow up). Wonder Girl had been revamped and retconned, and was no longer very closely tied with Wonder Woman. Kid Flash had never been that constant a companion of The Flash to begin with. And the remaining characters (Raven (no relation), Changling [formerly Beast Boy], Cyborg and Starfire) weren't associated with adult DC characters at all, and seemed to live pretty much on their own. The result was a group that functioned as adult adventurers, but still maintained their status as teenagers. This was important, because the hottest thing in comics was Marvel's X-Men — also a group of functional adults who benefitted from a youthful image. Creators Marv Wolfman (writer), George Pérez (artist) and Len Wein (editor) stayed with the series for several years, creating a large fan following. For a time, the series actually was able to compete with The X-Men on its own turf. One thing that eventually did it in was the inevitability of the characters growing up. By the time Wonder Girl was married, Robin was a college graduate and Kid Flash was converted to the new Flash, it had become hard to maintain the "teen" image. 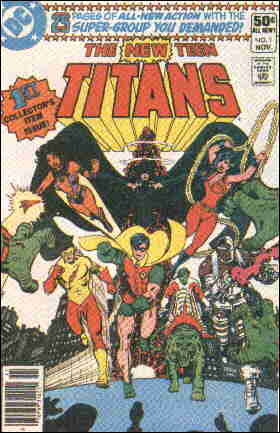 With its December, 1988 issue, the word "teen" was dropped from the team's name, and from the comic's title.